Don't fret over all those games Ubisoft canceled yesterday. You never knew about them anyway. As we reported yesterday, Ubisoft's latest financial filings include word that a number of upcoming titles have been canceled in reaction to what the publisher calls "major changes in the industry." Fear immediately set in amongst Ubisoft devotees, hoping against hope that long-awaited games like I Am Alive and the mysterious Beyond Good & Evil 2 somehow escaped the axe. Fortunately, it appears that none of the canceled games had ever been revealed to the public. "Terminated projects were unannounced projects," an Ubisoft spokesman told Eurogamer. Unfortunately however, when pressed on the nebulous status of I Am Alive and Beyond Good & Evil 2 the Ubisoft representative remained coy. "We have nothing new to report on those two titles for the moment," he said. 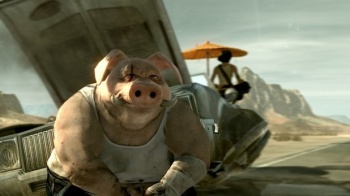 Beyond Good & Evil 2 is the highly anticipated sequel to an adventure game that went unappreciated in its own time. Though far from a financial success, the game has more recently developed into something of a cult-classic. Outside of a leaked gameplay video and a teaser trailer, any actual information regarding BG&E2 has been scant at best, leading many fans to fear that development could cease at any moment. Likewise disaster survival game I Am Alive has spent the last few years in limbo. Following its 2008 debut, the game switched developers then virtually vanished. The last we heard, it was still in development but beyond that, Ubisoft remains stoic. As for that other heavily anticipated Ubisoft series, don't worry; Assassin's Creed: Revelations was never in any danger of being shelved. When a series spawns terrifying YouTube weapon knockoffs, it has earned the title of "lucrative franchise," and nothing short of Guitar Hero-esque levels of market oversaturation can possibly kill it.